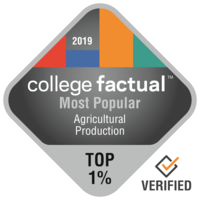 It's hard to find a better school than North Carolina State University at Raleigh if you wish to study Agricultural Production. Located in Raleigh, North Carolina, this university is best suited for students who prosper in a city atmosphere. If you're concerned about taking on an excessive amount of student debt, you'll want to be aware that NC State students graduate with just $25,532 in student loans. Students from outside the U.S. make up 12.3% of the people at North Carolina State University at Raleigh. Find all the vital specifics on NC State by looking at their scorecard. It's hard to beat University of Mount Olive if you wish to study Agricultural Production. Students who enjoy a more slow-paced life will appreciate University of Mount Olive's location in the small town of Mount Olive, North Carolina. Each year, around 93.0% freshmen get scholarships, with the typical award being $7,629. Considering 18.0% of UMO's campus resides outside North Carolina, you are going to have a lot of chances to befriend students from all over the country. Get all of the crucial facts on UMO by checking out their scorecard.